05.10.08 Four Maine students are competing this weekend in the Elementary Nationals in Pittsburgh. Two thousand one hundred ninety six players from across the nation are competing in 9 sections--230 more than last year, and the most in recent years. The venue is the beautiful David Lawrence Convention Center alongside the Alleghany River in downtown Pittsburgh. Chess dads at the Elementary Nationals in Pittsburgh look at a game. Image courtesy USCF. The soaring convention hall is a monument to Pittsburgh's steel city heritage, as are the many steel bridges crossing the Alleghany just outside the hall. Games for all sections except K-1 are being played in one giant hall--1,000 boards and nearly 2,000 players all at once. The Elementary Chess Nationals are starting as the annual Iron and Steel Convention ends in the same facility--a transition from physical iron and steel to the iron will and steely determination of these young competitors. The four players representing Maine are Matthew Fishbein of Cape Elizabeth (K-5 championship section), Matthew Reale-Hatem of Cape Elizabeth (K-6 U1000), Olivia Reale-Hatem of Cape Elizabeth (K-3 UNR) and Zach Hamilton of Glenburn (K-6 UNR). 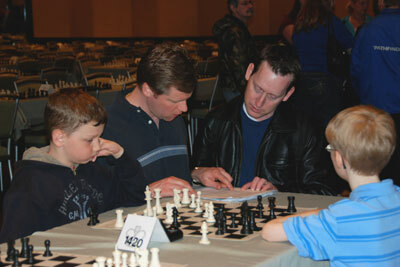 The events began on Thursday, May 8, 2008 for players who entered the National Bughouse and Blitz championships. Matthew Fishbein and Matthew Reale-Hatem teamed up in their first Bughouse tournament together to take 3.0 in this 10 round event. In the evening, Matthew Fishbein scored 6.0 and Matthew Reale-Hatem and Zach Hamilton each scored 4.0 in K-6 Blitz. The Matthews each played 20 tournament games in one day! Matthew Reale-Hatem also had to face a player rated 2025 in two of his games. Friday dawned cloudy and gray, but the thousands of players and family were all smiles as they headed for the Convention Center from the 7 tournament hotels for the first round of the main tournament at 1:00 p.m. Matthew Reale-Hatem won his first game over Jason Castano of Florida. Olivia Reale-Hatem took an impressive 40 minutes in her first ever competitive match, although she came up on the losing end, this time, against Sydney Closser of Tennessee. Zach Hamilton won his Round 1 game over Ashley Ip of New York. Matthew Fishbein's game against Shawn Swindell of New York City lasted 2 hours and 45 minutes, ending in victory for Matthew as he threatened to Queen on move 56. After dinner, the players returned to the hall for Round 2 at 7:00 p.m.--quite the challenge for children considering that the time control is G/120! Matthew Fishbein was paired on Board 7 in his section against David Brown of California, who has a USCF rating of 1758, and after 2 hours David came up victorious. As of this writing, results of the Round 2 matches of Matthew Reale-Hatem, Olivia Reale-Hatem and Zach Hamilton were not yet available- more to come on these in tomorrow's report.